Bronte Horticultural Society, established in 1925, is a gardening club for people from across Oakville and the surrounding area. We are a small group with a friendly and supportive social environment. If you have an interest in gardening and want to learn more, you are welcome to join. We meet monthly, except for July and August, to hear speakers on a wide range of current garden and plant topics. Hands-on information is shared in an informal manner between member gardeners at our meetings and events. We also have three Master Gardener members who provide expert information and advice just for the asking. We hold special events throughout the year – a garden tour of our members’ gardens combined with a BBQ lunch, an annual plant sale in May at Bronte Village Mall (Bronte Rd and Lakeshore Rd), a fun bus tour to interesting garden sites within Southern Ontario, and pot luck dinners and social events. Members are encouraged to assist us in maintaining the garden at historic Sovereign House in Bronte and other community horticultural-related projects. Our members also receive an informative monthly newsletter with updates on gardening events occurring across the GTA and Halton Region, and a monthly column written by a Master Gardener. 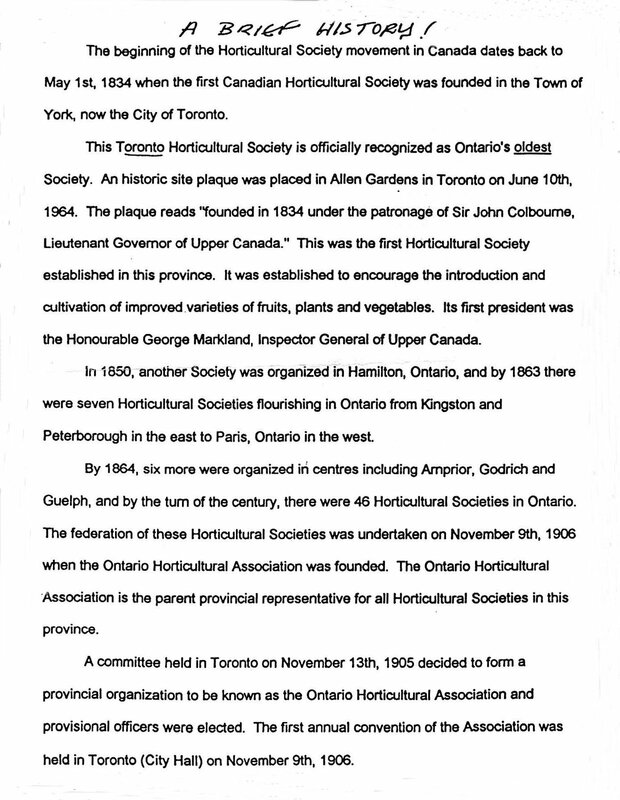 Each society in Ontario has a floral emblem to officially represent them. 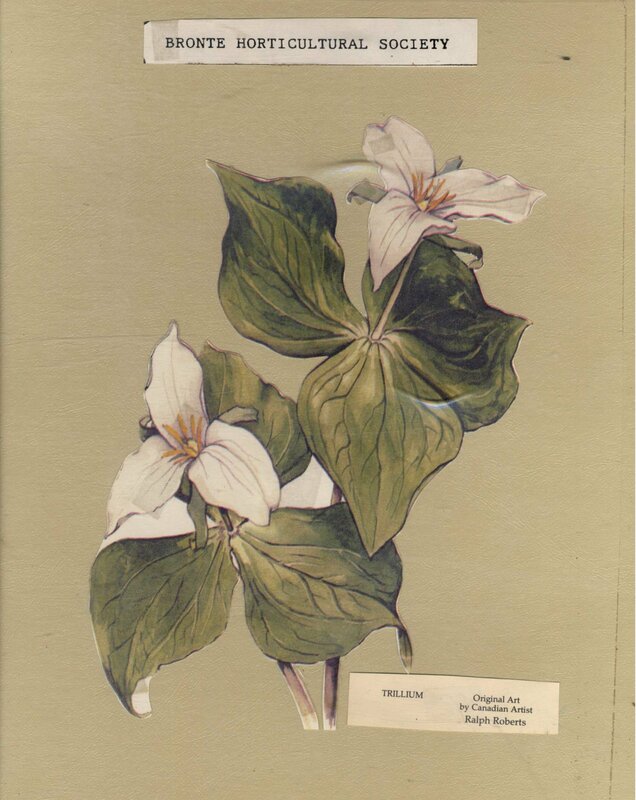 Bronte has adopted the Grandiflorum trillium. Monthly meetings are held the fourth Tuesday of each month, 7:30 pm, at Sir John Colborne Recreation Centre, Lakeshore Rd and Third Line. If you want or need more information about us, e-mail us at brontehorticulturalsociety@gmail.com. The societies of the Ontario Horticultural Association are divided into 19 districts. Bronte is in District 6, also referred to as part of a Carolinian District. For more information go to http://www.gardenontario.org/index.php. 1. By holding meetings for instruction and discussion on subjects connected with the theory and practice of horticulture. 2. By encouraging the improvement of home and public planting grounds, by the planting of trees, shrubs and flowers and by promoting other acts of public beautification. 3. By interesting young people in the enjoyment of horticulture by any means as may be considered proper. 4. By arranging field trips to local places of horticultural interest. 5. By distributing seeds, plants, bulbs, flowers, shrubs and trees in ways calculated to create an interest in horticulture. 6. By promoting the circulation of horticultural books and periodicals. 7. By providing social activity to encourage membership, fellowship and the desire to further all facets of horticulture.